Sandvik Coromant has been ”selling commodities”, in their case cutting tools, for almost 70 years in the eye of a purchasing manager. Now that way of doing business, is about to change: – We want to see ourselves as a complete solution provider, and the Internet of Things can make this possible, says Managing Director Peder Arvidsson. Sandvik Teeness in Norway, is part of Sandvik Coromant (the ”Home of silent tools”). 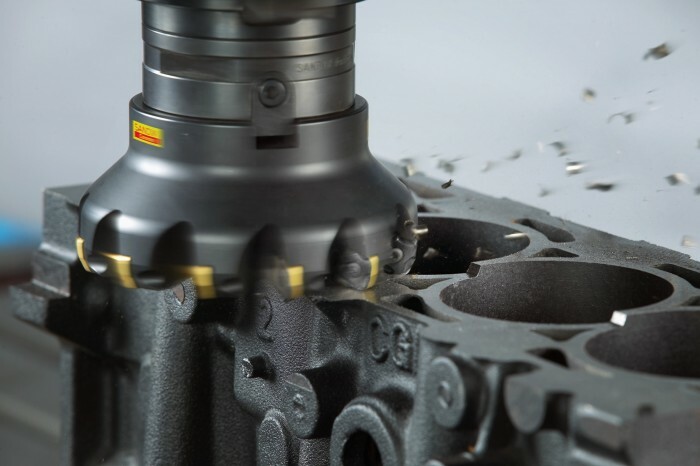 This vital part of the Swedish Sandvik Group, makes tools for metal cutting. Indispensable in the manufacture of cars , airplanes and trains. – Our business model today, is warehouses around the world selling physical products. Let’s say that we have around 100 000 customers, around the world. And we have actually had the same business model, since 1950. But this is an industry that is about to be turned on it’s head, by the arrival of the Internet of Things. Peder Arvidsson, Managing Director of Sandvik Teeness has been with Sandvik for 20 years, but moved to Sandvik Teeness in Trondheim, Norway just three years ago. He believes that the Internet of Things, will be involved in a huge leap forward for his company, in the coming years. – Being a tool producer, we will have contact with… let’s say… the purchase manager of a company. Who would like to see our tools, as a commodity. One tool, is just the same for them as the other tool from another brand, and it’s just a discussion about price. This has been the business modell for a little too long, and this is what has to change, according to Peder Arvidsson. – We want to see ourselves, as the cutting tools version of Coca-Cola, Levi’s or Apple. We are a brand, we have a value, and it’s much more than just the product. Peder compares the IoT-situation that is about to arise, with the way the use of hardware and software has evolved in the computer world. Sandvik Coromant is preparing for the new situation, that the Internet of Things is about to create. But there is still a long way to go. – Let’s say that the 20 last years, we have focused very much on adding value. Telling the customer the real value, of having a good tool compared to a normal tool. But we have never gone into a business model for this. – We want to say to our customers, that ”we will provide you with the technicians and experts, that will let you get the most out of our equipment”. To move into a more modern and succesfull business model, is very important for Sandvik Coromant right now. Especially since the market for it’s products, in an important sector like oil and gas, is declining. This is of course due to the worldwide situation (and in the case of Sandvik Coromant, particularly in North America). There is though, a big problem stopping the implementation of a more modern business model, at the moment. – All our customers, are heavily invested in today’s technology. It’s a very conservative business. But now that ”everyone” is slowly moving into the Internet of Things, it will of course be fatal for a company like Sandvik Coromant, to get stuck in the same old business model. – There is indeed a very big change going on. I mean, if I were to say something visionary, I would say that in the future, you pay for the software and the knowledge and the tools are for free. That is just an enabler, to use our software. But maybe that’s 20 years down the line. To foresee which customers would be most interested in embracing change, is not too difficult. – When we talk about different markets, it’s not geographical. We have to divide it into industry segments. The leader in this area, will be the customer that has the most to gain. And that will be the customer, with the most expensive components. These top industry segments are – for Sandvik Coromant – aerospace, automotive, and oil and gas. But it is common knowledge that the oil and gas sectors, are not really booming right now. Which means that aerospace is an industry, that Sandvik Coromant will be focusing on a lot, in the near future. – This is an industry, with components worth 100 000 dollars and up. Companies like Rolls-Royce and GE Aviation and and Pratt & Whitney… producing jet engines, their components are worth 100 000 dollars and up. So if we come up with new tools, that can take away quality issues for components with this value, of course we think that they are the ones who will be interested in this first. So – for someone like Peder Arvidsson or a company like Sandvik Coromant, the Internet of Things is heaven sent. – Every year, every day, every minute, we have struggled to be seen as a solution provider and not as a commodity provider. Internet of Things will definitely help in our direction. We need some kind of carrier, of the value that we want to give our customer. And with the Internet of Things, we have that now. It’s a new opportunity definitely. – We can finally have a carrier, for the value that we want to give to our customers.